“Fast food workers are walking out on their jobs today to once again protest low wages, demand the right to unionize and fight for better working conditions. The strikes are occurring in 50 cities including New York City, where there are multiple walk-outs plus a rally planned. “NEW YORK (Reuters) – Fast-food workers staged strikes at McDonald’s and Burger Kings and demonstrated at other stores in sixty U.S. cities on Thursday in their latest action in a nearly year-long campaign to raise wages in the service sector. 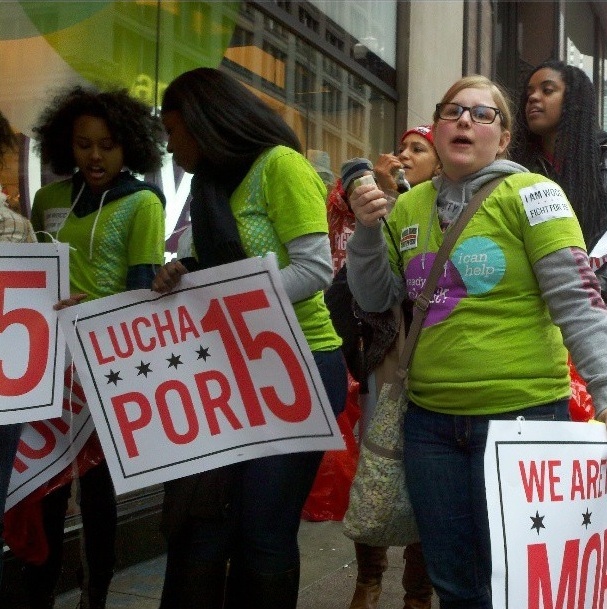 Workers Organizing Committee of Chicago issues new report: A Case for $15. Democracy Now! was there when workers at dozens of restaurants owned by McDonald’s, Burger King, KFC, Taco Bell and others went on strike Thursday and rallied in a bid for fair pay and union recognition. Organizers with the Fast Food Forward campaign are seeking an increased pay rate of $15 an hour, about double what the minimum-wage workers are making. Workers and their allies demanded a wage that would let them support their families. Martyna Starosta filed this report. No One Owes You A McRestaurant…..
You see and hear comments like that all the time. While boisterous protests targeted Chicago-area Walmarts Friday, a new local union formed in mid-November coordinated a second wave of actions calling for an increase in the minimum wage to $15 per hour, well beyond a gradual statewide increase to $10.55 that may be approved next year. The Illinois minimum wage is currently $8.25 per hour. The activities were part of the Workers Organizing Committee of Chicago’s “Fight for 15” campaign. The committee says it already includes employees at more than 100 businesses. After supporting the Walmart rallies, committee members marched down Michigan Avenue and rallied both outside and inside Water Tower Place. Like FFWC in New York, WOCC is a new independent union made up of workers tied together by a shared city and similarly low wages, not a single employer. Both FFWC and WOCC are backed by unions and labor community groups, and so far aren’t recognized by any employers. And they’re making the same demands: allow a fair process for unionization and start paying $15 an hour. Organizers say that could be achieved through union contracts with individual companies, or through joint bargaining with several employers at once. Either way, it’s a heavy lift.